Nelle Harper Lee and Milly Francis will be inducted into the Alabama Women’s Hall of Fame on March 7, 2019. The induction ceremony will take place at 10:30 a.m. in Alumnae Auditorium on the Judson College campus in Marion, Ala., and will be open to the public at no charge. A luncheon will follow the induction ceremony. Wayne Flynt, Professor Emeritus at Auburn University and longtime friend of Harper Lee, will give the keynote address at the luncheon. Reservations are required for the luncheon (tickets $50) and must be made by March 1 by calling (334) 683-5109. 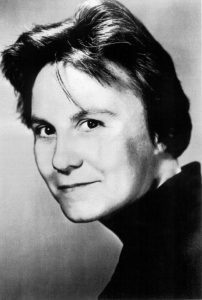 Best known as the Pulitzer Prize-winning author of the novel To Kill a Mockingbird, Nelle Harper Lee was born in Monroeville, Alabama, on April 28, 1926. She attended Huntingdon College in 1944-45 and transferred to The University of Alabama in Tuscaloosa in 1945. Pursuing her interest in writing, Lee contributed articles to the University’s campus newspaper, The Crimson White, and its humor magazine, the Rammer-Jammer, of which she eventually became editor. During her junior year, she was admitted into The University of Alabama School of Law, which at the time allowed undergraduate students to begin their law degrees early. Six months before earning her law degree, Lee made the pivotal decision to move to New York City to pursue her dream of becoming a writer. She published To Kill a Mockingbird in 1960. The novel has remained continuously in print and is a staple of schoolroom reading lists in the United States and abroad. By the 50th anniversary of its publication, To Kill a Mockingbird had been translated into more than forty languages and had sold more than forty million copies worldwide. In 2015, Lee published another novel, Go Set a Watchman, which became an immediate #1 New York Times bestseller. In addition to the Pulitzer Prize, the numerous awards, recognitions, and honors received by Lee during her lifetime for her contributions to literature include the Presidential Medal of Freedom (2007), the National Medal of Arts (2010), and six honorary doctorates from colleges and universities. Lee was a generous benefactor to her church and to many charitable, educational and nonprofit organizations, and privately, to many individuals. She died in Monroeville on February 19, 2016. Lee will be inducted by Joy Williams Brown, a personal friend. Milly Francis was born in 1802 or 1803 in east central Alabama, just below the juncture of the Coosa and Tallapoosa Rivers. Her parents were Josiah and Polly Francis, Creek Indians of both European and American Indian descent. In 1812, a traditionalist Creek faction whose members became known as “Red Sticks” called for an end to accommodation with the United States, a movement that would lead to the Creek War (1813-1814). Milly’s father Josiah joined the Red Stick movement as a prophet and began a traditionalist settlement known as Econochaca, or Holy Ground, between what is now Selma and Montgomery. Holy Ground would become the war capital for the Red Sticks and the site of a pivotal Creek defeat during war. After the defeat at Holy Ground, Francis joined his family, who had evacuated to west Florida. In 1818, Milly saved the life of Duncan McKrimmon, a U.S. soldier stationed near her home of present-day St. Marks, Florida. McKrimmon, lost in the forest after a fishing trip, was captured by Creek warriors. As the warriors prepared to execute him, Milly interceded on McKrimmon’s behalf, and the warriors spared his life. The incident was widely publicized and romanticized throughout the region. In 1819, she settled at Tuckabatchee (a Creek town on the Tallapoosa River near Montgomery) and married an Indian warrior, Cochan Hoboithley, with whom she had eight children. In 1836, she and her children were among the Creeks relocated on the Trail of Tears to Oklahoma. Her husband died in 1837 on his way to join them after fulfilling military obligations in Florida. Years later, while investigating frauds committed against the Indians, Colonel Ethan Allen Hitchcock visited Milly to hear the story of McKrimmon’s rescue from her own lips. Moved by her story, and seeing her impoverished circumstances, he petitioned Congress to approve a small pension for her. In 1844, Congress passed a bill and approved a pension of $96 per year and the awarding of a medal. Milly died of tuberculosis in 1848 without receiving the pension or medal. Milly Francis will be inducted by Alex Colvin, Public Programs Curator at the Alabama Department of Archives and History. For more information about the induction ceremony, luncheon, or the Alabama Women’s Hall of Fame, contact Beth Poole, Executive Secretary, at bpoole1@judson.edu or 334.683.5109. The Alabama Women’s Hall of Fame is located in Marion, Alabama, on the campus of Judson College in A. Howard Bean Hall. The Hall of Fame was established in 1970 to provide a permanent place of honor for Alabama’s most outstanding women and a place for visitors to learn about the significant contributions these women have made to the state and nation. Inductees must be deceased for two years and be from or affiliated with Alabama. Women to be inducted are selected by unanimous vote of the board of directors of the AWHF.